OUR PRICE: $21.50 - Join Rewards Get $1 Dance Dollars On This Item! 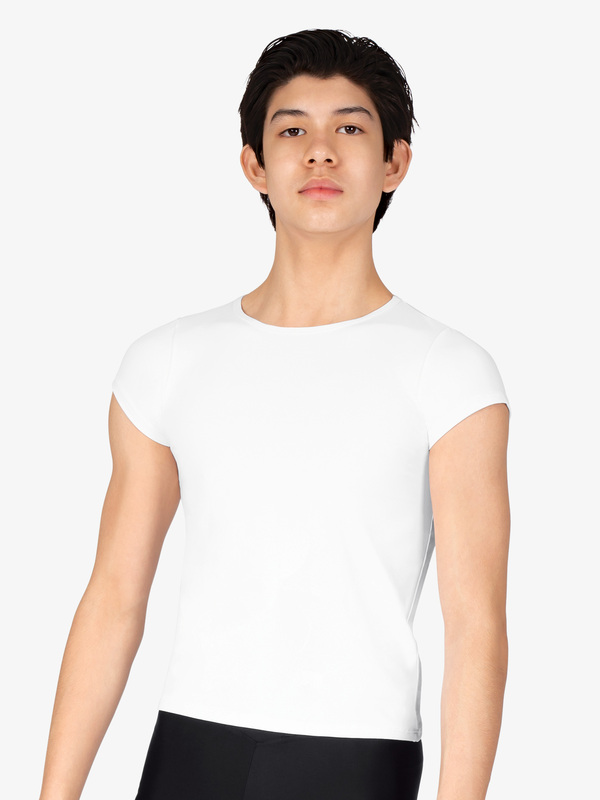 Boys Ballet Dancewear is made of supportive fabrics that are durable, colorfast and move with the dancer. A versatile short sleeve "Snug fit" pullover (shirt length falls to the waist). This shirt was part of the uniform I needed to purchase for my two boys' dance classes. It is thick enough that they don't need an undershirt, soft, and stretchy, but it runs VERY small. I ordered size 7-8 shirts for my guys. It was able to get around my 4 year old's chest and tummy but it showed his belly button when he raised his arms. It couldn't even stretch around my 5 year old's chest. I realize the shirt should fit snugly, but it was short and tight in the armpits as well. I'm going to reorder a 9-10 for the guys. Both weigh about 45 pounds and they are 42 and 45 inches tall, if that helps anyone else for sizing. This shirt is perfect for my 8 year old son. It solves the baggy , boxy look of wearing an undershirt. It is definitely form fitting. My child usually wears a size 8 and the 9/10 was exactly right. Our only issue is that there is a tag sewn into the neck that cannot be removed without damaging the shirt. Is this long enough to be tucked in an stay in? My 10 yr old son has been wearing 'regular' undershirts, which always shrink into a square shape. I'm looking for something that is long enough to be tucked in, even after a few washes. This shirt does not look like it reaches much past the natural waist. Any thoughts? Better options that Discount Dance offers? I would recommend style N7085C which is a nylon/spandex blend. It will not shrink when washed, and is a bit longer than the Body Wrappers shirt we carry.